When you paddle, each stroke propels your hull forward against our familiar nemesis, drag. But why does the canoe move forward, and not in some other direction? And more fundamentally, why does it move at all? The concept of momentum provides the answer. And it all can be understood by considering … space boots. When I was in 6th grade I bought a collection of science fiction stories at a garage sale. One of the tales centered on an astronaut marooned outside his spacecraft; how he became marooned, I don’t recall. Fortunately, he was wearing a space suit – it’s pretty cold in outer space. Unfortunately, the space suit had no thrusters for propelling him back to his craft. And he had a limited supply of air left to breath. How did he get back inside his rocket ship before running out of air? By using science! Our stranded astronaut recalled that when you fire a rifle, there is recoil. The rifle “throws” a bullet in one direction, and in response the rifle moves in the opposite direction. The astronaut realized that if he threw something in the direction opposite his spacecraft, his body would “recoil” in response and move toward the spacecraft. Knowing that he couldn’t throw his oxygen tanks (gotta breathe), his space helmet (thus avoiding the worst case of brain freeze ever), or his space gloves (he needed functioning hands to open the hatch back into his spacecraft), he took off his space boots and threw them away from his rocket ship as hard as he could. He had a pretty good aim because the rest of him drifted slowly toward the space ship’s hatch, whereupon he was able to climb back inside. All because he remembered physics, and the concept of conservation of momentum. And, of course, because he had space boots. This equation shows that momentum is linearly proportional to an object’s mass, as well as linearly proportional to its velocity. And by “linearly” we mean that neither quantity appears as a square, cube, square root, etc., but only as itself. This means that if you throw a baseball at 45mph, and a major league pitcher throws the same baseball at 90mph (e.g., twice as fast), then the baseball thrown by the major leaguer has twice as much momentum as when you threw it. With each stroke, the paddle blade is accelerating a volume of water. It may seem that your paddle is planted in concrete at the catch, but in truth there is slippage; if you watch the strokes of adjacent paddlers you’ll see little pools of swirling, aft-moving water behind their blades at the conclusion of their power phase. This slip is illustrated in the sequence shown in Figs. 1-5 showing a side view of the power phase. The paddle rotates at and after the catch, and slips sternward in the inertial (Earth-based) reference frame as the water entrained by the blade accelerates. Figs. 1-5: Power phase, side view, with both hull and fixed fiducials. The minus sign indicates that the water’s momentum is in the opposite direction of the hull’s momentum. This is because in physics velocity is a vector quantity, which means velocity has both a magnitude (referred to as “speed”) and a direction as well. The minus sign here indicates that the momentum of the slug of water is opposite to the momentum of the hull since the water and the canoe move in opposite directions. So to move the hull, you impart momentum to the plug of water entrained by your paddle. And the hull will travel in the direction opposite the plug of water that you have “thrown.” This should be familiar to anyone who has paddled a canoe; the hull doesn’t move in the same direction as your paddle blade moves in the water, nor does it move perpendicular to the path of the paddle. And perhaps the most interesting take away, particularly relevant to our discussion, is that the momentum of the water equals the momentum of you and your canoe at the end of each stroke. It’s exactly like our astronaut floating freely in space – to move toward his spacecraft, the astronaut threw his space boots in the direction opposite his ship, and he zoomed off. If he had heavier space boots, or threw them faster, he would move faster in response. For a fixed paddle size and power phase stroke finishing speed, the numerator in equation is a constant. So to go faster our paddler should get a lighter hull, lose weight, or both since the only remaining variable in this case is the combined mass of the canoe and paddler. For a fixed power phase stroke finishing speed, our paddler could move a bigger slug of water by using a paddle with a bigger blade in order to entrain more water with the paddle stroke. For a fixed paddle size, our paddler could move the slug of water faster with a faster stroke power phase finishing speed, or use a smaller paddle but have an even faster power phase finishing speed. Or, our paddler could lose weight, buy a lighter hull, get a paddle with a bigger blade, and move that blade faster. Phew! I’m tired already, not to mention broke from the cost of all the new gear. Practically speaking, each option will appeal to specific paddlers based upon energy, paddle force, and power considerations. We’ll address energy issues below; paddle force and power will be addressed in a subsequent Science of Paddling article. Fig. 6: Poling up a drop. So each time the poler plants their pole and propels their canoe forward, they are changing the momentum of the Earth, pushing it in the opposite direction! As noted above, a canoe can attain a particular speed by using the paddle to move a larger mass of water slowly, or a smaller mass of water more quickly. The choice is yours as long as total momentum is conserved, per Equation (4). The difference between these two scenarios becomes more apparent when we consider the energy expended in each scenario, e.g. the cost in energy to you, the paddler. Since the “larger” blade’s area A2 is always bigger than the “smaller” blade’s area A1, the ratio A2 / A1 will always be greater than 1. The approximation above shows that, to first order, you will always expend more energy paddling with a smaller blade than paddling with a larger blade in order to attain the same hull speed. The cost of using a smaller paddle to achieve the same hull speed is greater energy expenditure – by you. Surprise! 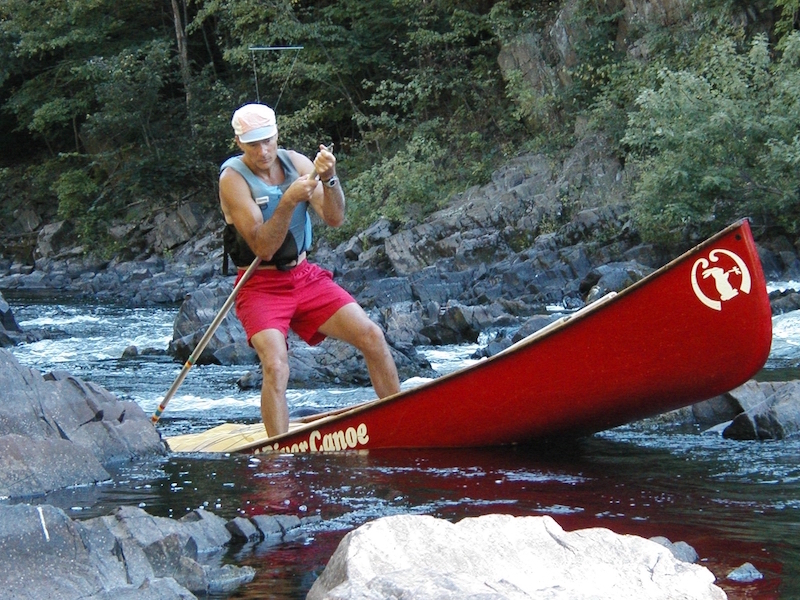 In both scenarios the mass and speed of the canoe and paddler at the end of the stroke stays the same, hence their contribution to kinetic energy is fixed. But while the mass of water moved by the smaller paddles is less, the water’s kinetic energy is only linearly proportional to this reduction, and this gain is more than offset by the squared dependence of kinetic energy on the velocity. Since the smaller slug of water moved by the smaller blades must be moved faster to achieve a given hull speed because of momentum conservation, what you appear to gain in moving a smaller mass of water you more than lose in energy expenditure by having to move it with a faster power phase speed. So if you prefer a smaller blade, use it briskly, and have a well-trained aerobic/anaerobic engine. I’ll be the first to admit that I was initially puzzled by these results; smaller blades are the trend among many local paddlers. But thinking back to my own experiences in 2008, I realized that I had actually lived these equations. That Summer I purchased a new bentshaft paddle with a wider blade; bend angle and shaft length were the same as my other paddles. It took me a while to zero in on how take advantage of the new paddle, since I seemed to be pulling harder but not going any faster, and getting more tired in the process. Things got better when I spent some time paddling C-2 with a much more experienced partner. In doing so I learned to accelerate the blade more smoothly, and to employ a more “complete” power phase by not recovering before the wider blade’s velocity had reached steady state. In other words, a slightly longer stroke than the “choppy” stroke I had been using. A few sessions later, and suddenly my C-1 race pace improved, with a slightly lower cadence and with a lower heart rate, e.g. less energy expenditure. Granted, I’m mostly made of slow-twitch muscle fiber; I’m what you’d call a “grinder” when it comes to canoe racing. But I was able to grind at a faster race pace, using less energy, once I tamed the bigger blade. And I owe it all to space boots.